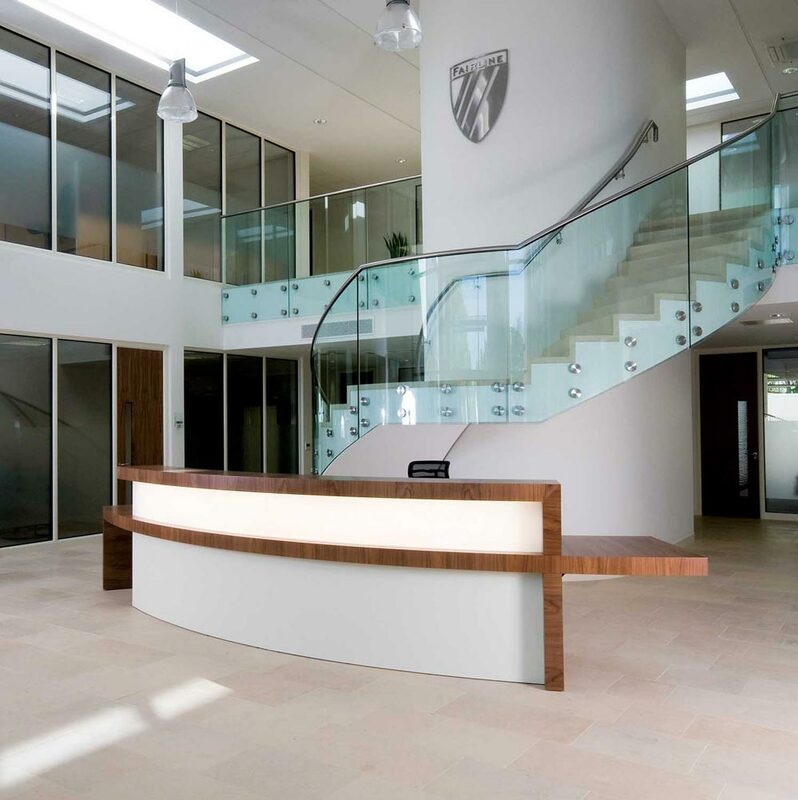 For most businesses and professional companies, the reception is possibly one of the most important areas in the building. It is the first place to be seen by new and existing clients when they enter, and so must make a strong first impression. 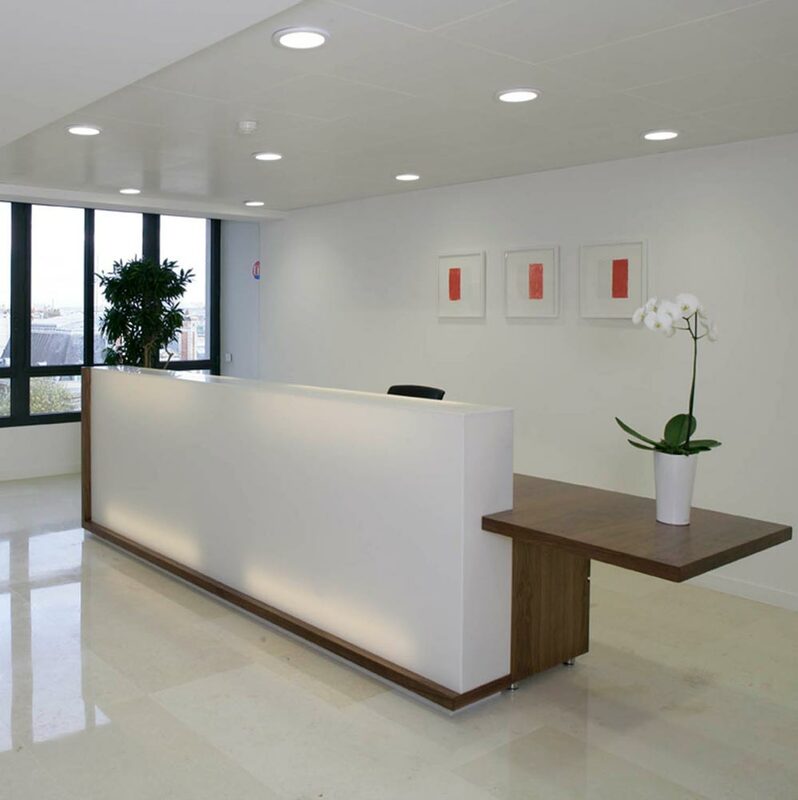 Often the reception area will be the only part of your business that a client sees, especially if you meet them there. 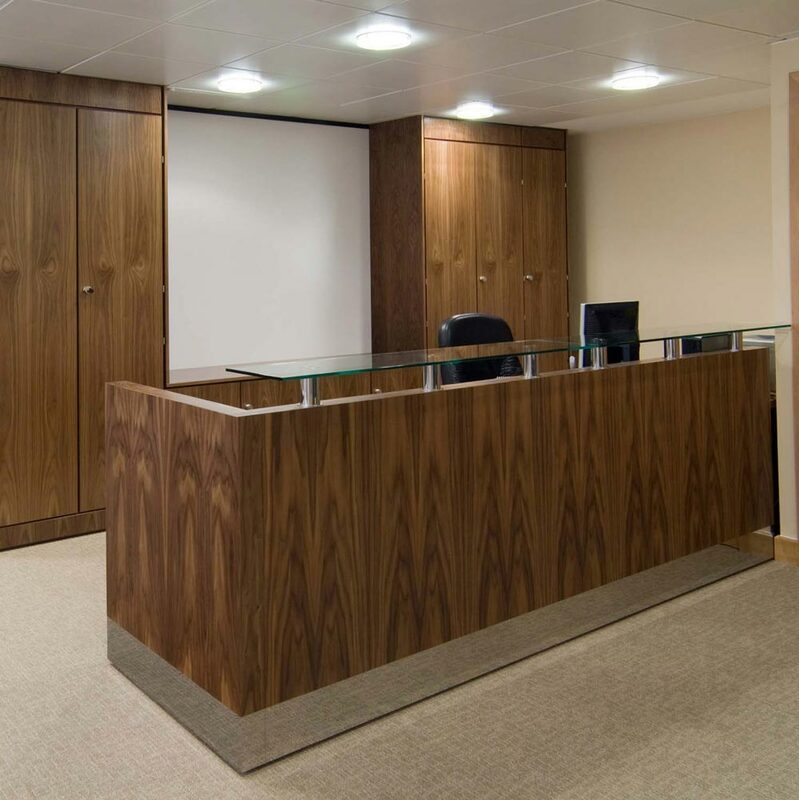 Therefore it is essential that your office furniture helps to create a welcoming and friendly environment. 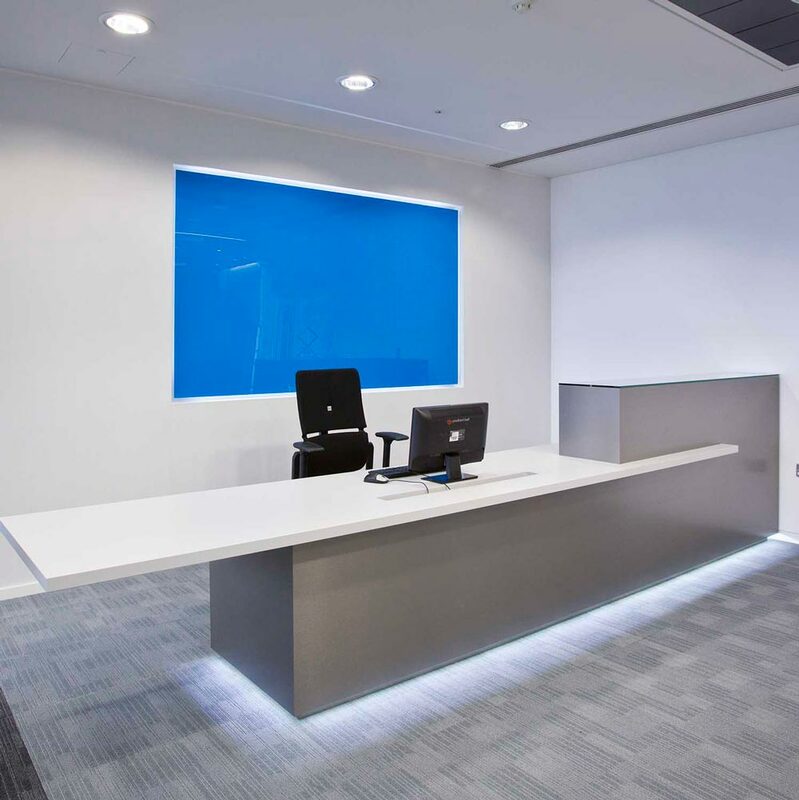 It is important for reception areas to be open, airy and bright. 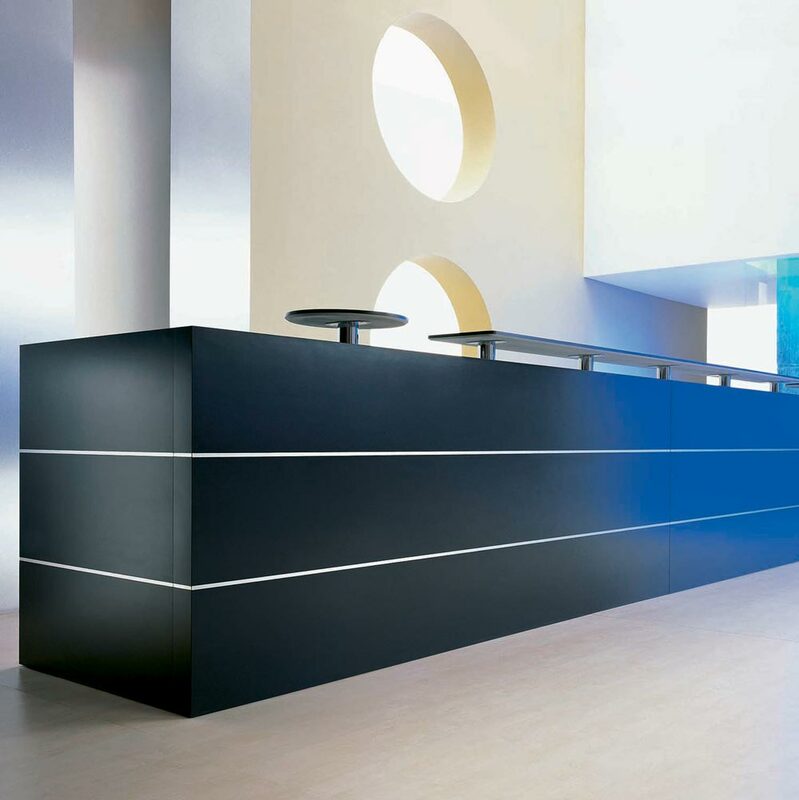 Crowded and dark spaces leave a bad impression on your clients and make them feel negative when they enter. Give your clients a happy feeling and make them feel welcome as soon as they enter; that way you are more likely to gain their business. Rapid Office can help. 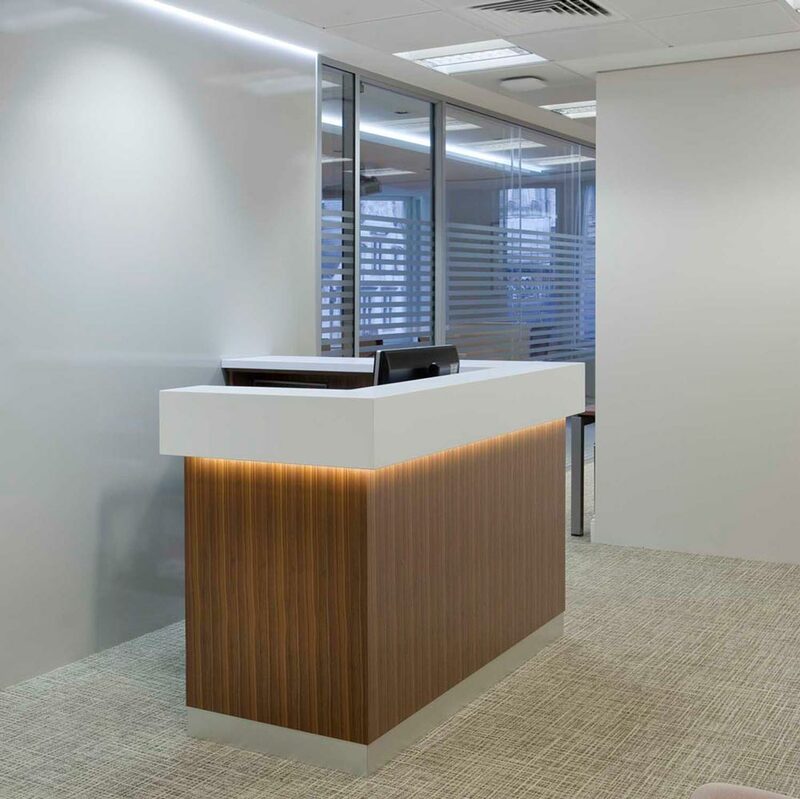 If you’re short on space but still want to make a good first impression on your clients, then your best approach should be as simplistic as possible. 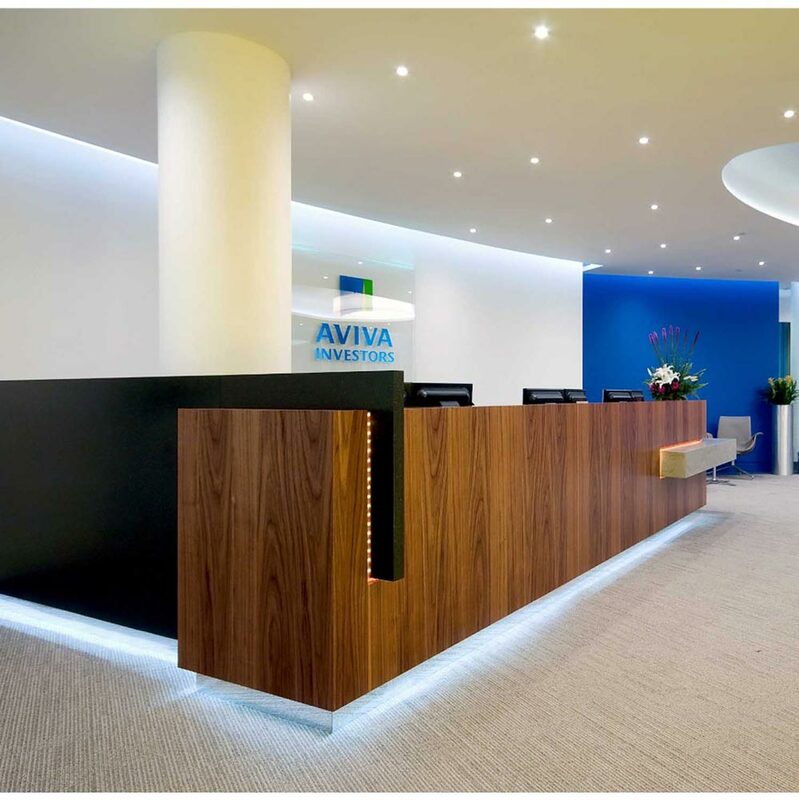 Simple reception sofas will make an excellent first impression on clients and visitors, and they are incredibly comfortable. A black sofa with chrome legs is a great way to give your reception area a classy look that will go with almost any reception desk. 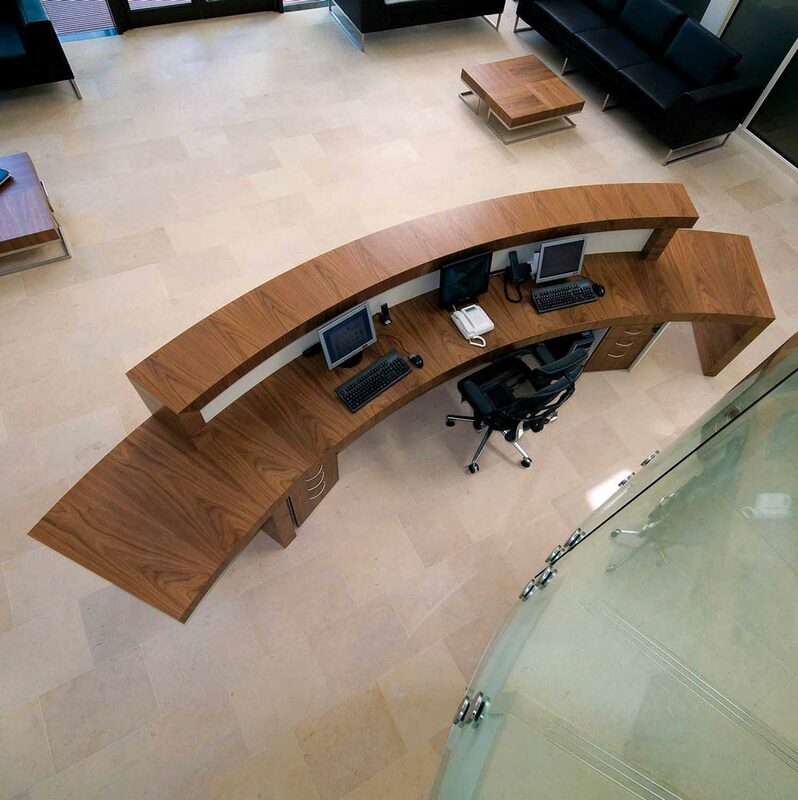 A sure-fire way to make visitors feel welcome in your business is by selecting the right chairs for your reception area. A low wooden leg armchair design has never gone out of fasion. Complete the look by selecting the chairs in your business colours and by pairing your collection with a glass or wooden coffee table to serve as a focal point. 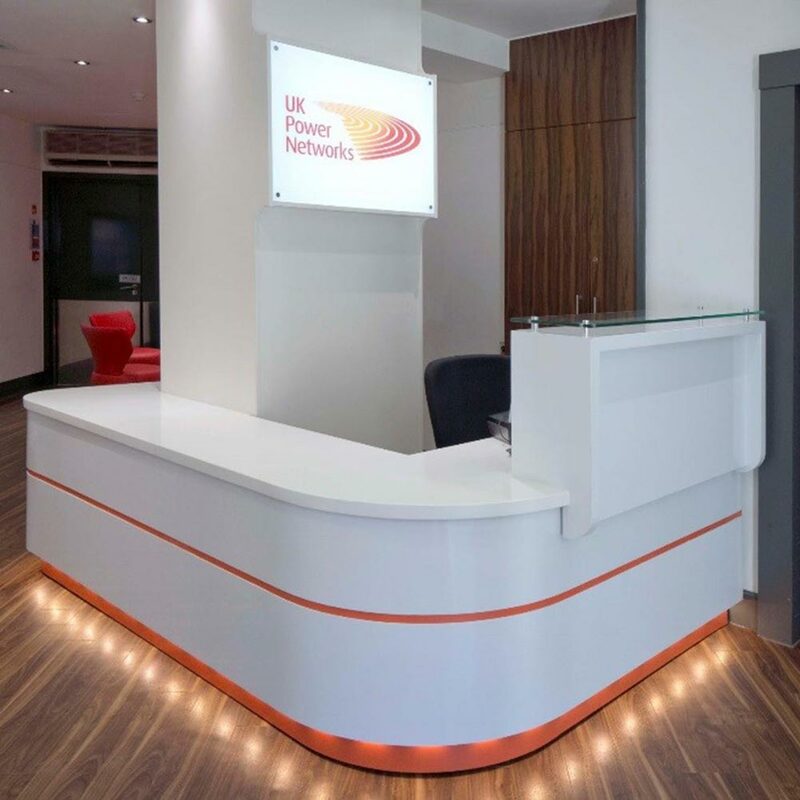 When visitors enter your business, the first thing they will see is a reception desk, which means it has got to make a good impression. 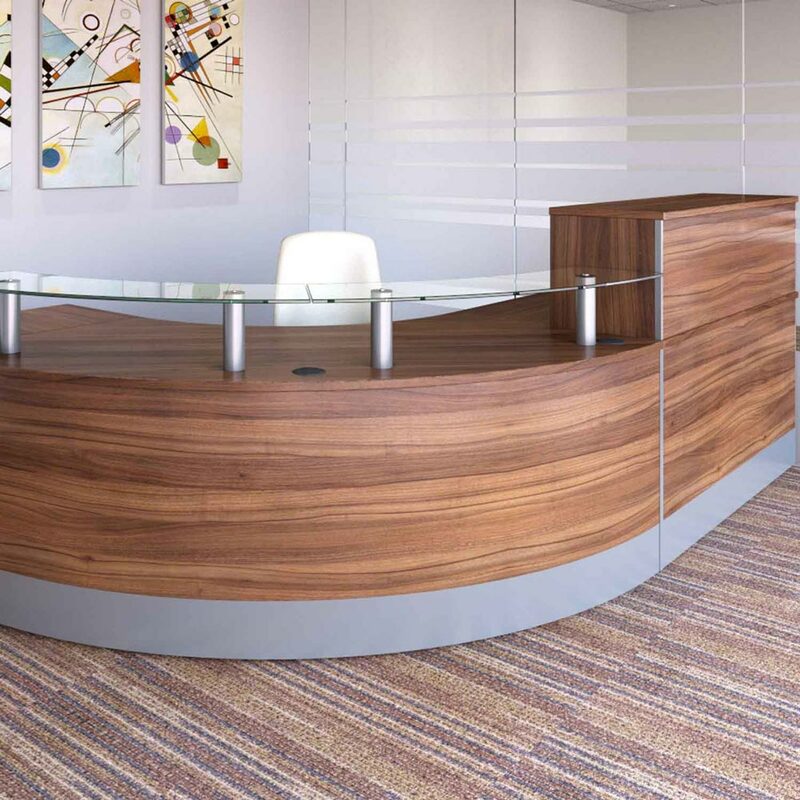 Bespoke office furniture is an excellent way to do this, particularly when it comes to reception desks. 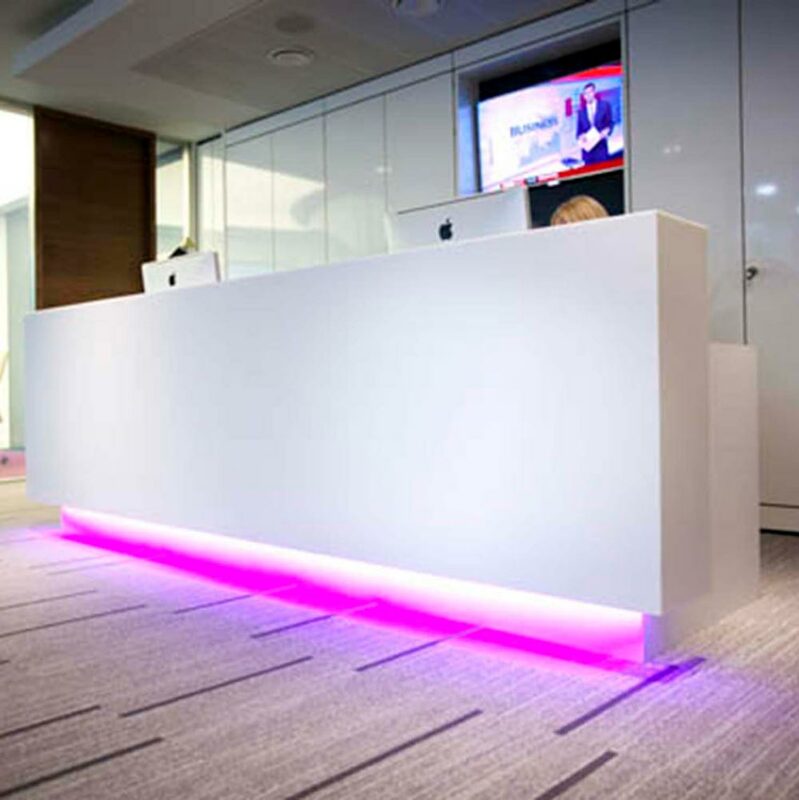 Choosing a bespoke reception desk allows you to use your imagination and come up with your own concepts. 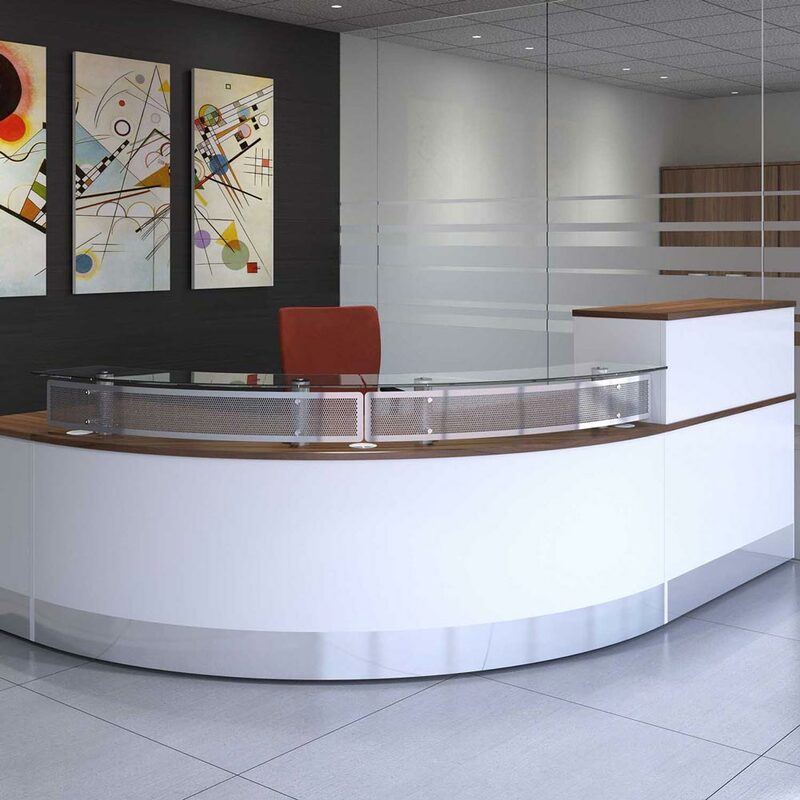 A circular reception desk is an incredibly stylish option, and gives the receptionist a great aspect of the reception area. 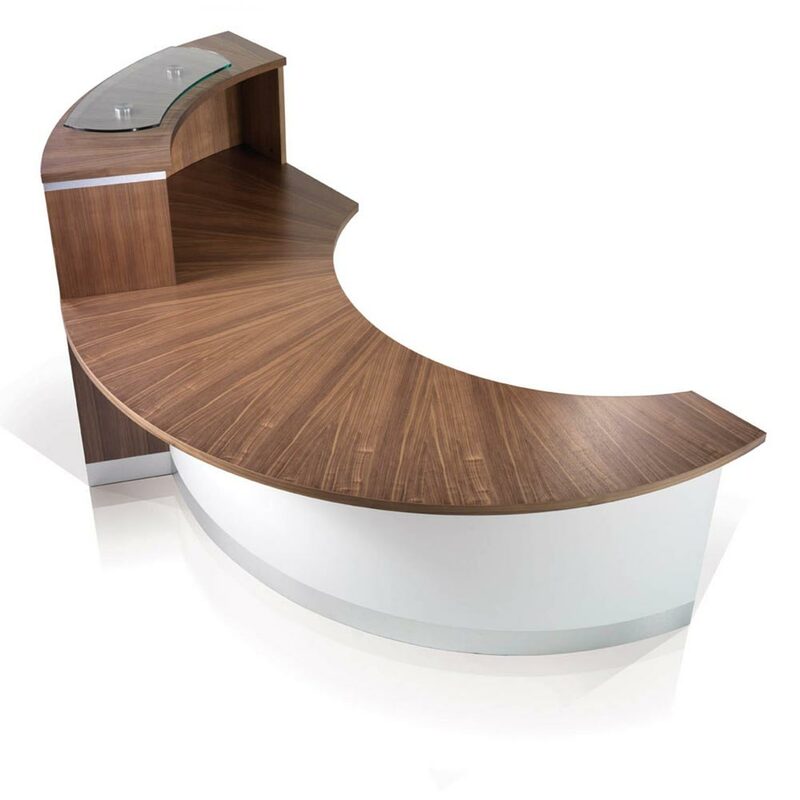 For multiple receptionists, consider a straight or curved desk as this allows multiple people to be seen to simultaneously. 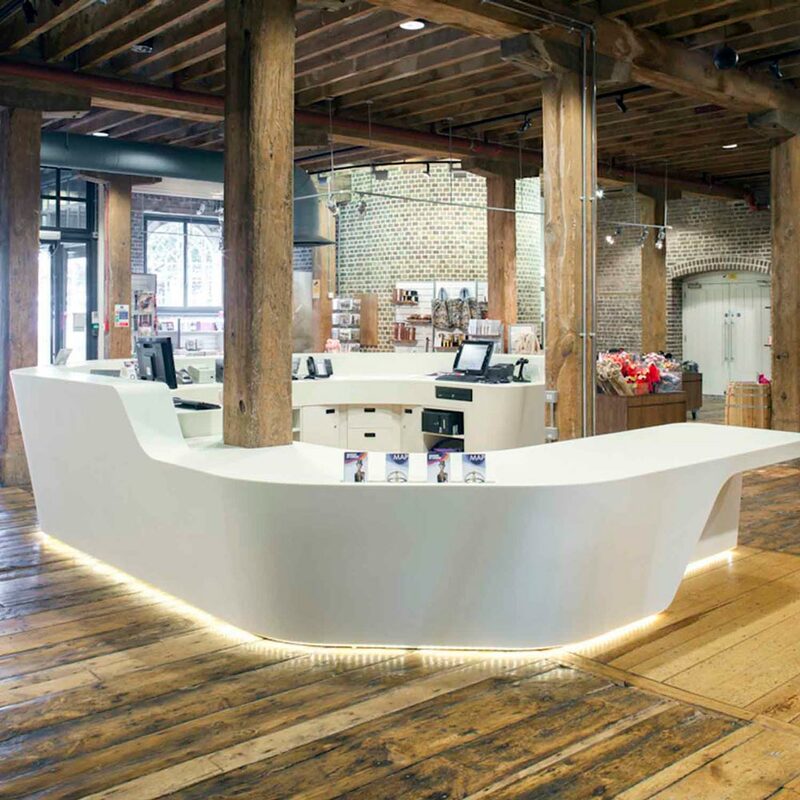 Corian reception desks are also very popular. 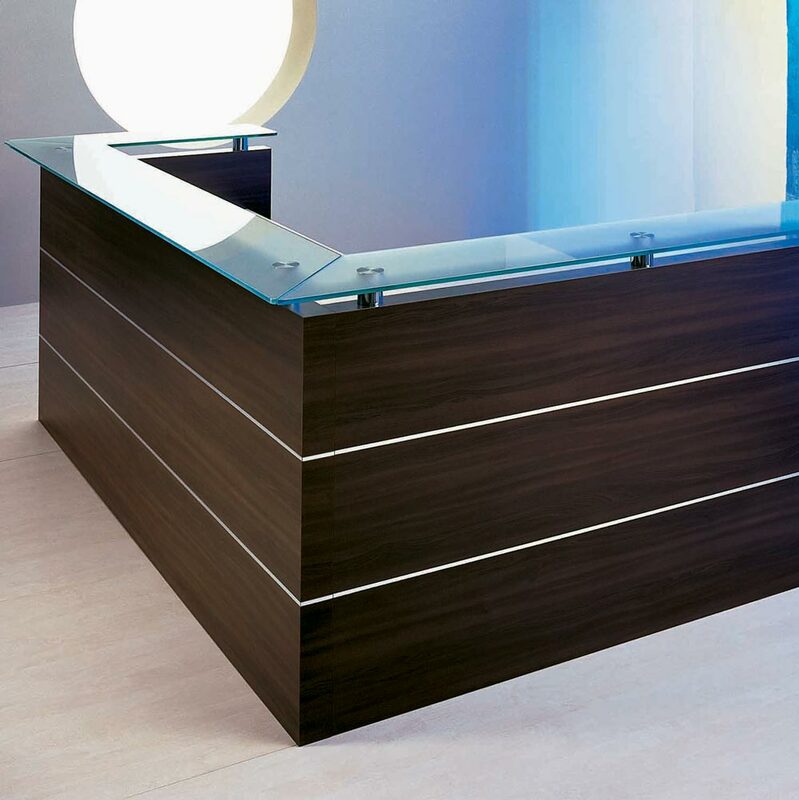 Once your clients have checked in with reception, make them feel at ease with some relaxing furniture. 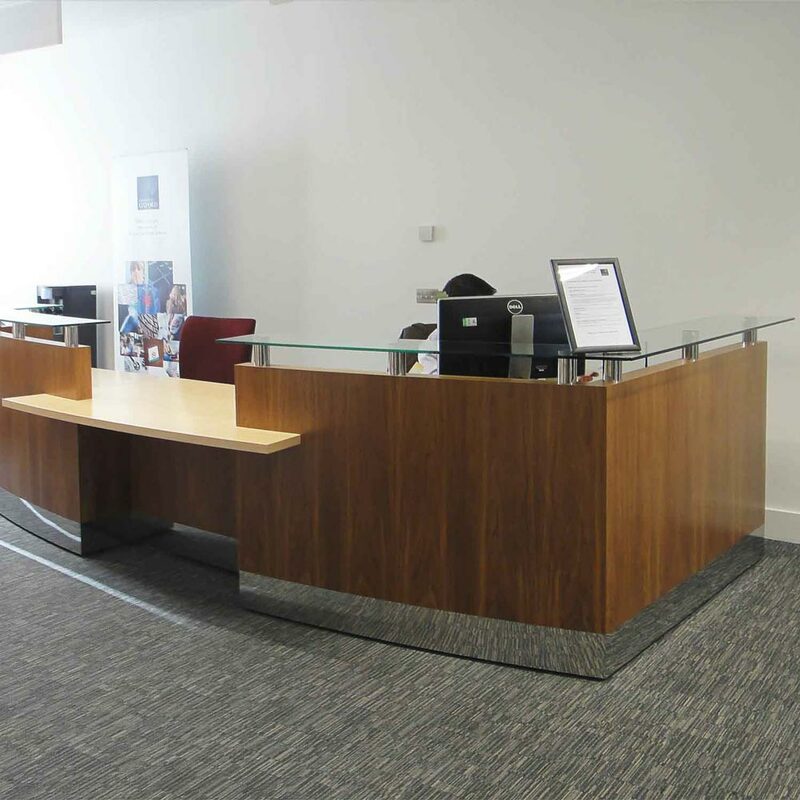 Modular reception seating is a popular choice as they are suitable for both large and small reception areas. Collections often consist of modern and comfortable-looking sofas with accompanying pod seats that can be re-arranged to suit your space planning. 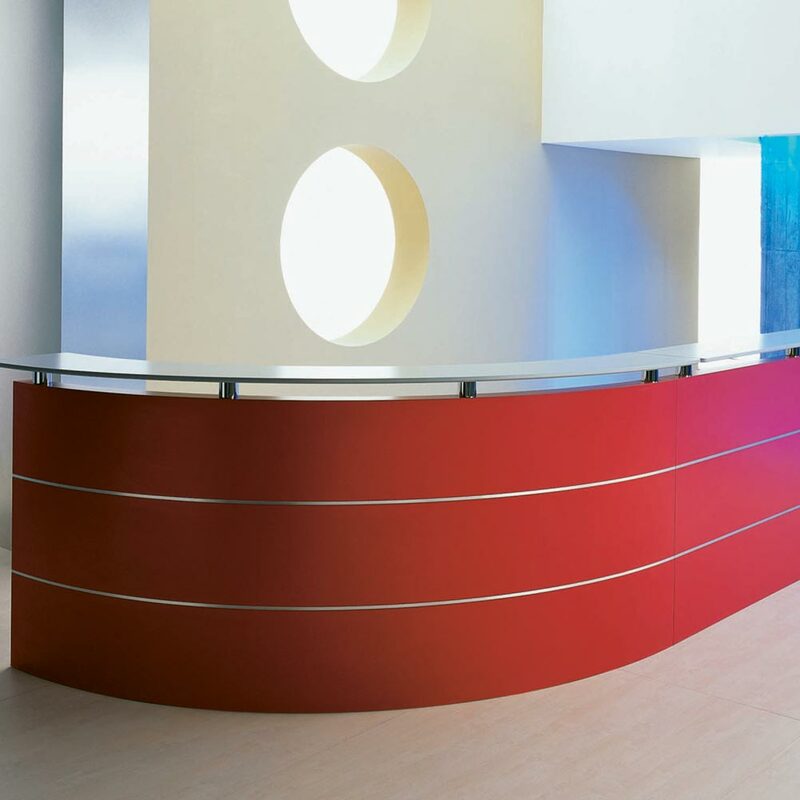 They can also be produced in different colours and fabrics to suit your reception area. 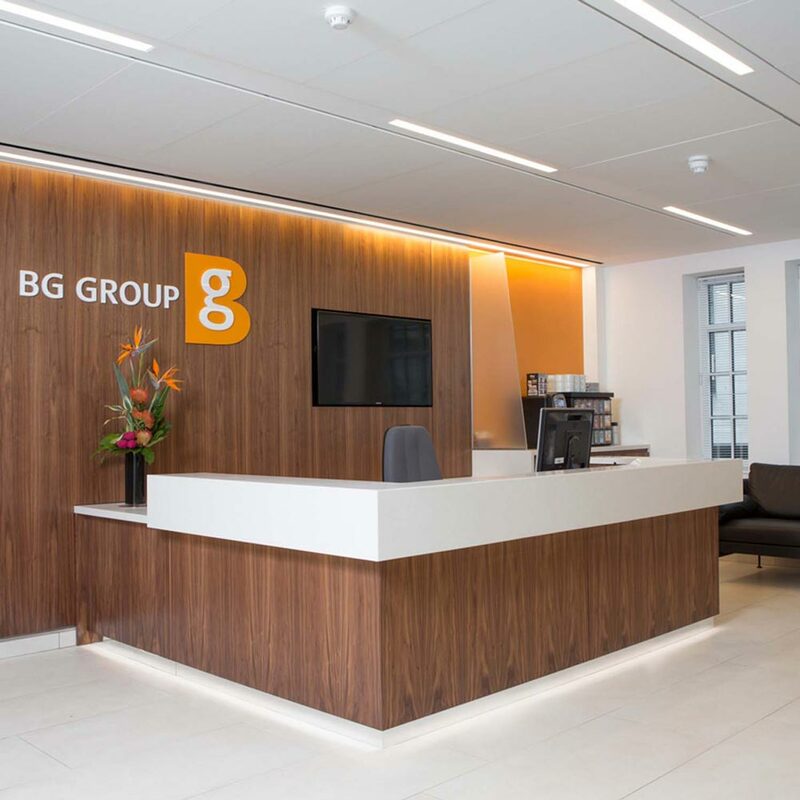 As modular seating collections usually consist or curved or square seats, it is important for you to decide on the type of approach you wish to take towards your area, such as formal or casual. 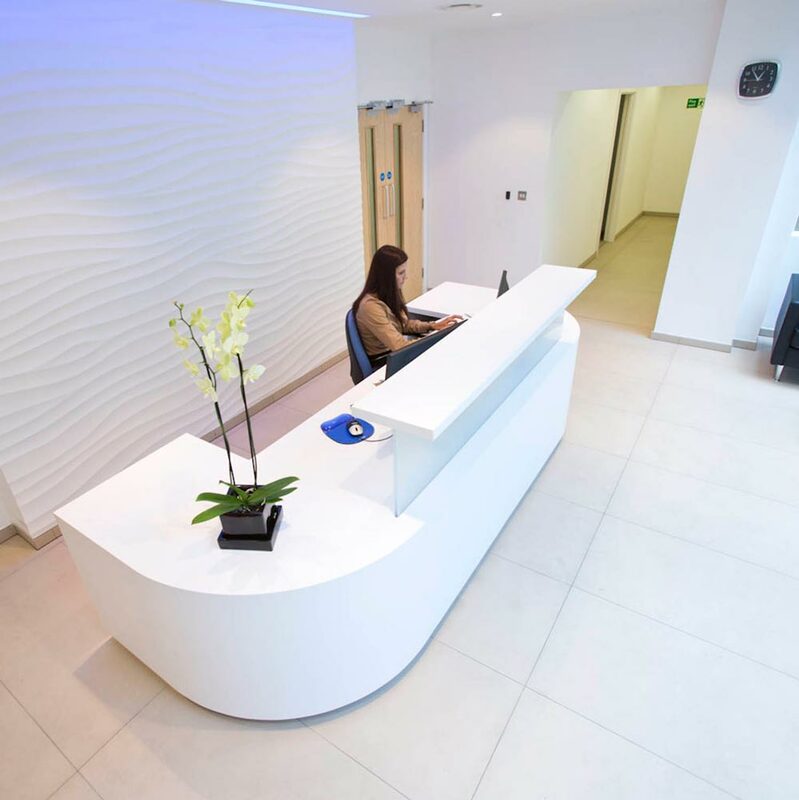 As mentioned before, a reception area will be the first, and last, thing that your visitors see, so it must give off a lasting and positive impression. 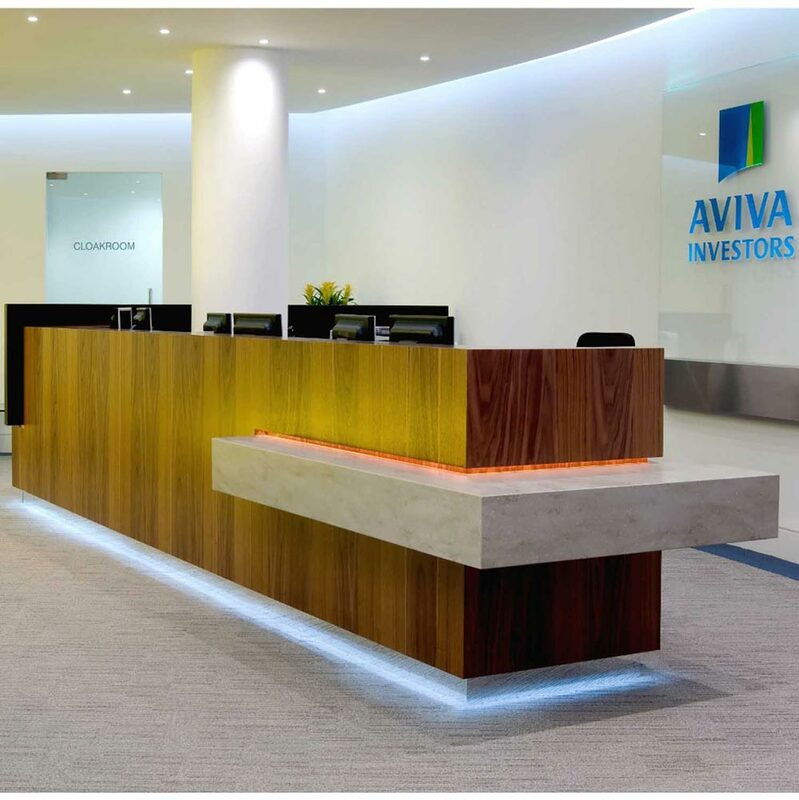 By opting for innovative and creative reception furniture, you will create an area that stands out in the minds of your visitors. 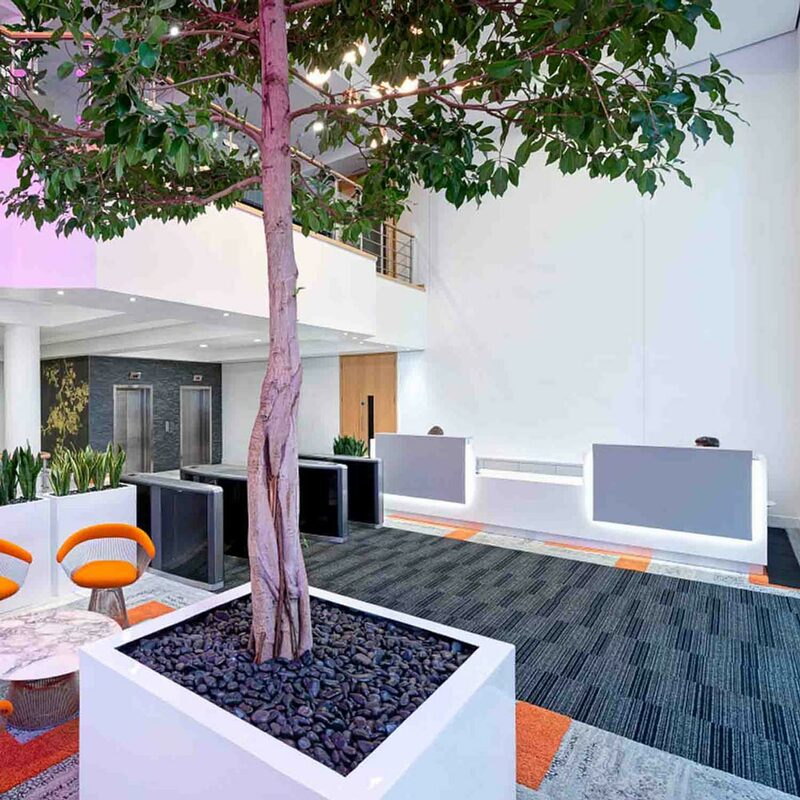 But whilst your reception area should look modern and clean don’t fall into the trap of making it cold and unwelcoming.